Tomorrow, I am leaving for a beach trip with my family, and I am so excited! I can't combat a trip without my essential oils. 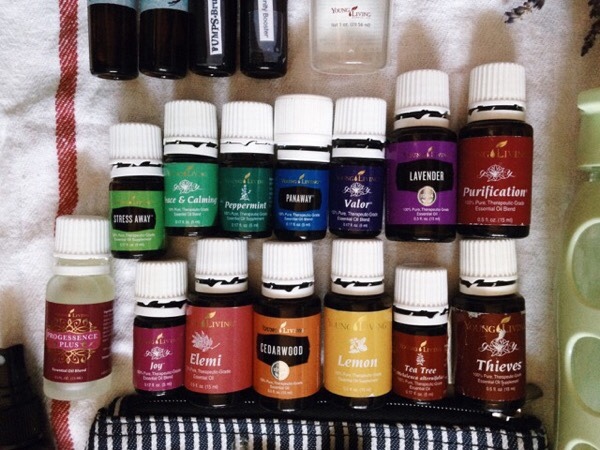 Ever since I started essentials oils, I haven't traveled anywhere without them, and now that my collection is growing and growing, the list of the oils that I use daily keeps growing and growing. 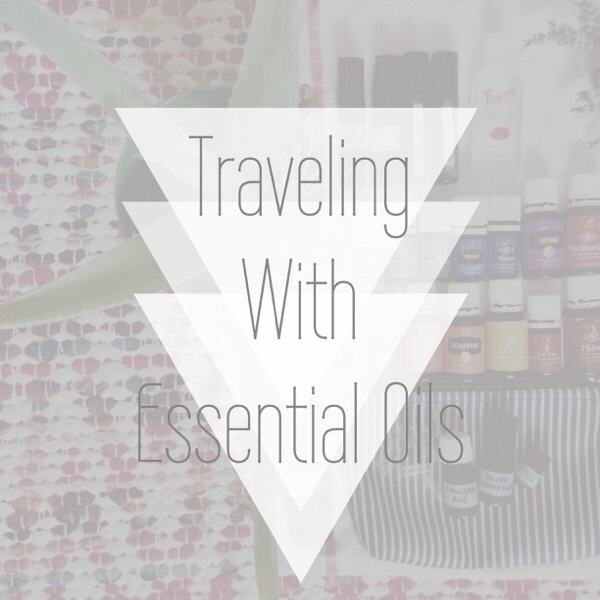 With the trip, I not only packed the essential oils that I use everyday, and often, but I also packed the blends that I made for specific parts of the trip, like the ride in the car, after meals, night time, and for those shaky nerves. On The Mend roll-on for cuts, scrapes, burns, anything irritating to the skin. Sweet Dreams roll-on because I have a hard sleeping anywhere but home. Bumps-Bruises-Aches-Pain roll-on for muscle flare ups. Cold Bomb/Immunity Booster to rid of any sickies, and prevent colds. Thieves Waterless Hand Purifier for when we eat out, and eat on the beach. Diluted Sclaressence roll-on for anxiety, mood boosting, women's health. 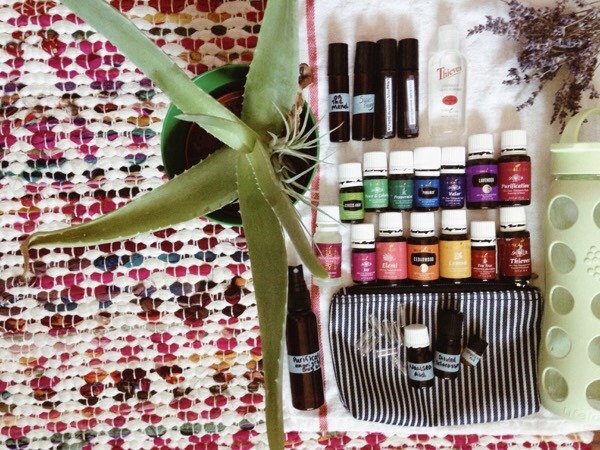 I always pack essential oils that help ease my car sickness. I get car sick so easily, and it lingers. It can be tough to fight off when you don't have something to ease the yucky feeling. My body must be incredibly sensitive to movement. My nausea aid is pretty easy to mix together. You don't ingest this in a v-cap, it is strictly aroma therapy. Nausea Aid is simply made with a carrier oil, 20 drops of peppermint, 20 drops of ginger, and 10 drops of lavender. You pour a drop in your palms, and inhale it, or put it on your chest like a perfume. I am not a passenger in the car without my nausea aid. Digestion aid is for those times you eat a big meal, and you feel ick the rest of the day. Sometimes, I get those into bad situations where my digestion is going crazy! I just drop about 5 drops of the digestion aid in a v-cap, and take it like a pill. Drink with a lot of water to dilute. I am planning on adding DiGize to my oil collection, but for right now, I made my own blend. In the small essential oil bottle, I blend together 10 drops of peppermint, 10 drops of lemongrass, and 10 drops of ginger together. It relieves those icky feelings of being much too full. My diluted Sclaressence is my favorite thing at the moment. I use it constantly, and I take it to work with me. I love the smell, and it actually relaxes me! It lowers my anxiety, and it brightens my day. I don't go anywhere without that little oil. On The Mend is a roller ball blend that I made after cutting myself at work one evening. It helped heal my cut fast, and I use it for other, little remedies too, like blemishes, scars, and cutical care. 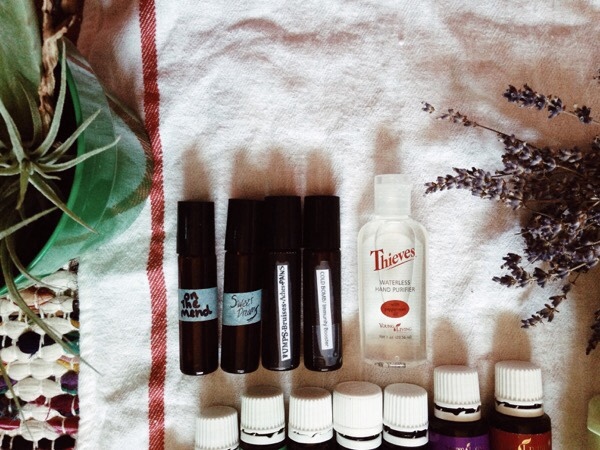 On The Mend includes a carrier oil, 10 drops of Frankincense, 10 drops of tea tree, and 6 drops of lavender oil. I bring this with almost everywhere! 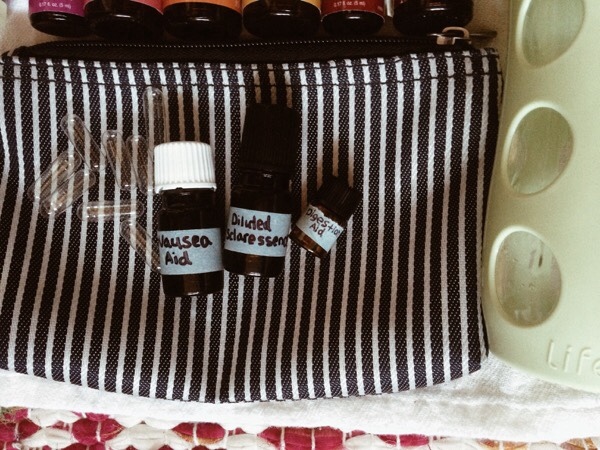 It is my essential oil first aid kit, and it smells better than antibacterial ointments. Sweet Dreams is something that I mixed up today. Since I don't have a travel diffuser (not yet anyway), I made up a sleep roll on. I usually diffuse Cedarwood and Lavender at night to help me sleep better, so I made a sleep roll on to help me get a good night's sleep while I am away from home. It is a struggle sometimes to fall asleep when I am away from home. Sweet Dreams includes carrier oil, 10 drops of lavender, 10 drops of cedarwood, 10 drops of Frankincense, and 5 drops of Sclaressence. It can be easily rolled on, mess free, and it will help md get a better night's sleep. Bumps-Bruises-Aches-Pains is a roll on for exactly what is in the name. BBAP includes carrier oil, 10 drops of PanAway, 5 drops of Valor, 5 drops of lavender, and 10 drops of peppermint. It works pretty well. I take it with me when I know that something strenuous may happen that day, or if I feel a headache coming on. Cold Bomb/Immunity Booster is also exactky like the name. It busts colds, and boosts immunity. I like to take it when I am in a public place, where could be a ton of germs. Cold Bomb/Immunity booster includes carrier oil, 20 drops of Thieves, 20 drops of Rosemary, 10 drops of Frankincense, 20 drops of Tea Tree, 10 drops of Lemon, and 5 drops of peppermint. I like to rub it on my chest so that I can inhale those great oils to boost immunity. I am very excited for my beach trip, and I have oily first aid kit with me to beat the not so fun parts of a trip. I will be posting about my drip on Instagram, and on here, so stay tuned. 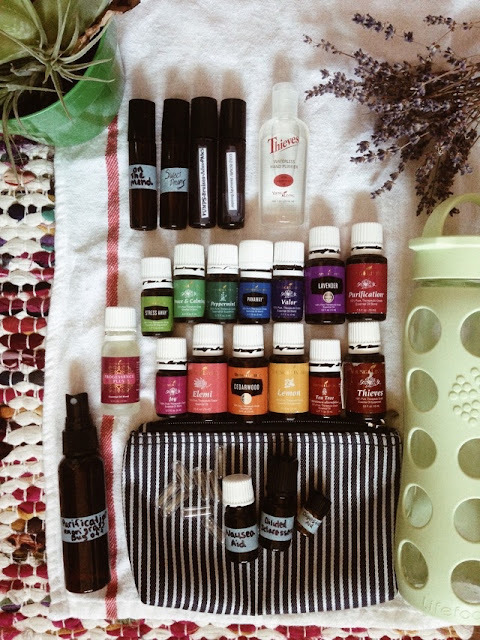 What oils can't you leave the house with? Please feel free to leave your comments or questions in the comments section. Happy Tuesday, All!